Off the northwestern coast of Lombok, Gili Trawangan is known as the party island, when compared to its smaller siblings of Gili Meno and Gili Air. However, the island’s nightlife was not the main draw for us. 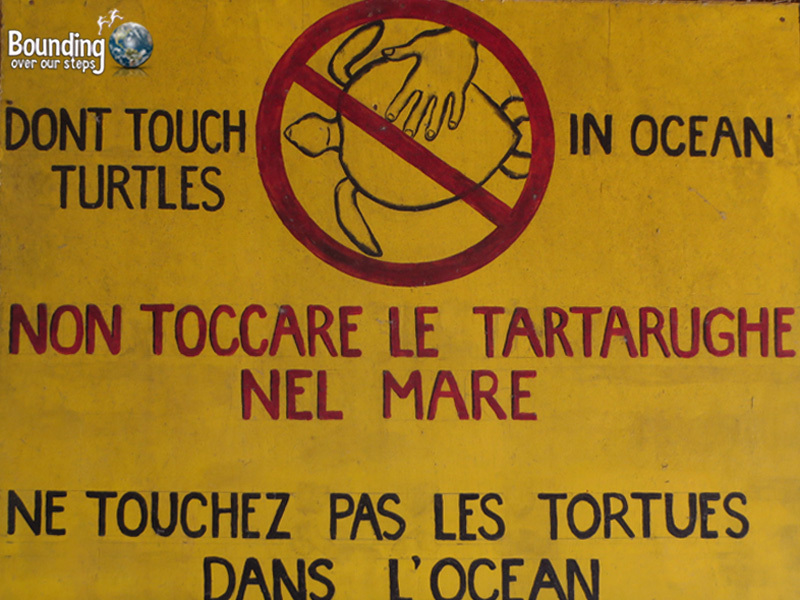 Instead, it was the promise of snorkeling with sea turtles that forced us to include the rowdy isle on our itinerary. 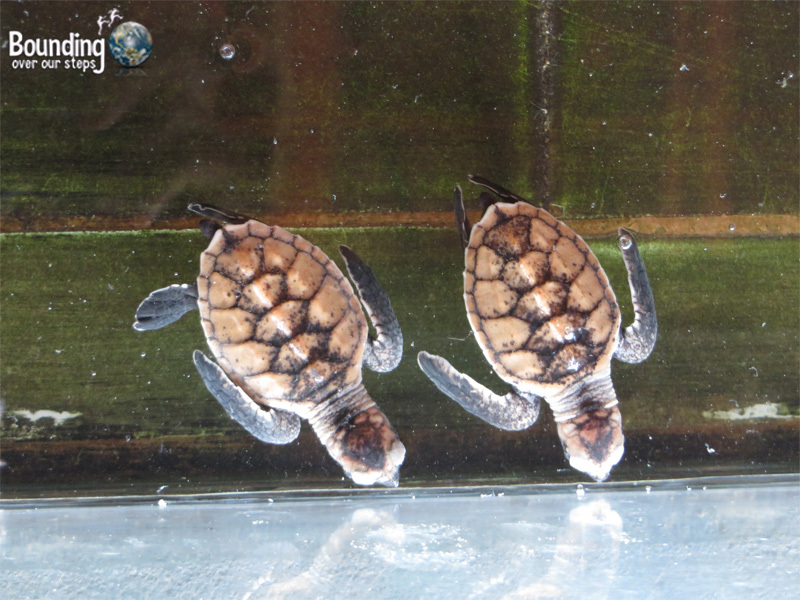 We were so pleased to learn that the residents of Gili Trawangan, along with some government funding and the support of tourist donations, have been working hard to conserve and regenerate the dwindling population of sea turtles. 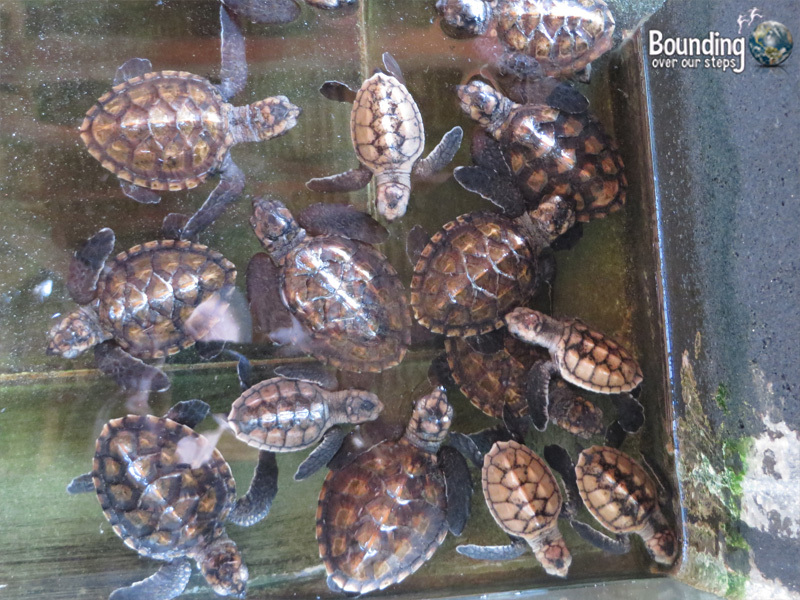 Despite the dire statistic that only one out of every 1000 hatchlings will survive to adulthood, the sea turtle conservation project has seen some success. Sea turtle eggs in the incubator. 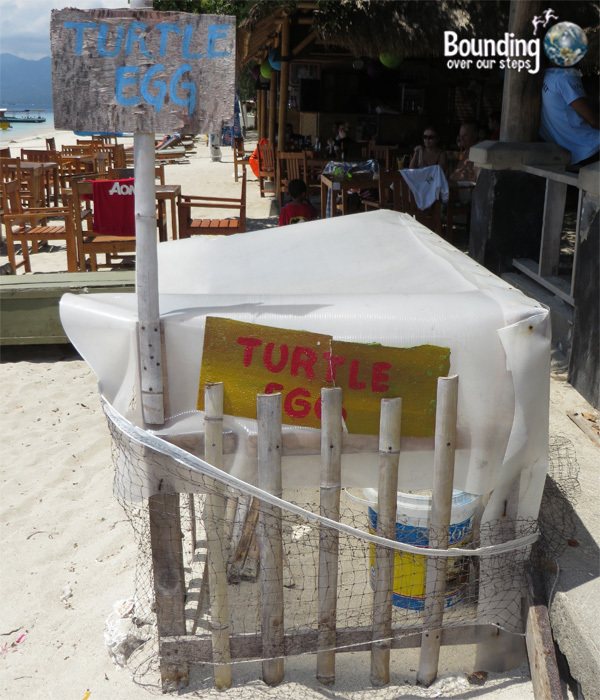 The project on Gili Trawangan houses an egg incubator, as well as three small pools for the varying-sized turtle hatchlings. About twice per year, project volunteers will release sea-ready turtles into the wild, right into the warm water off the island’s eastern coast. Looking at the big kids pool! Sea turtles almost big enough to be released. 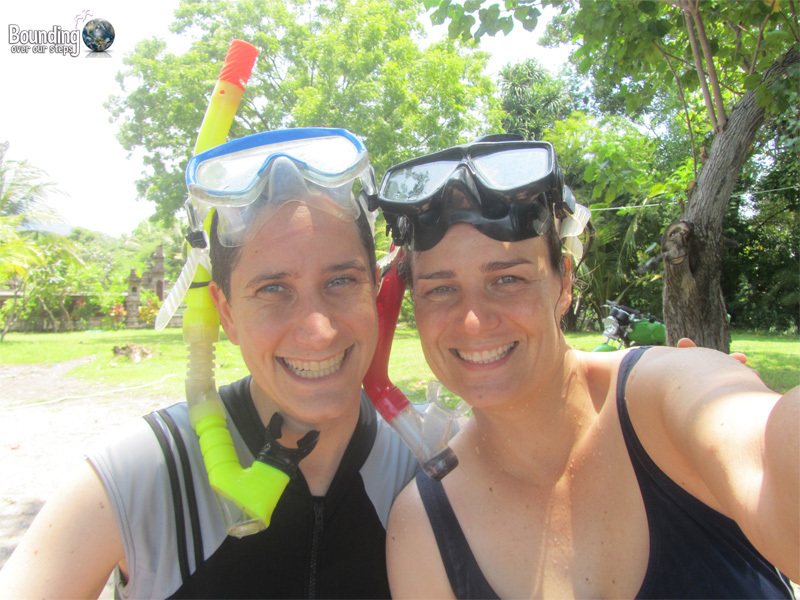 Snorkel gear is widely available for rent and we decided to spend the majority of our time on the biggest of the three Gili islands in the water. 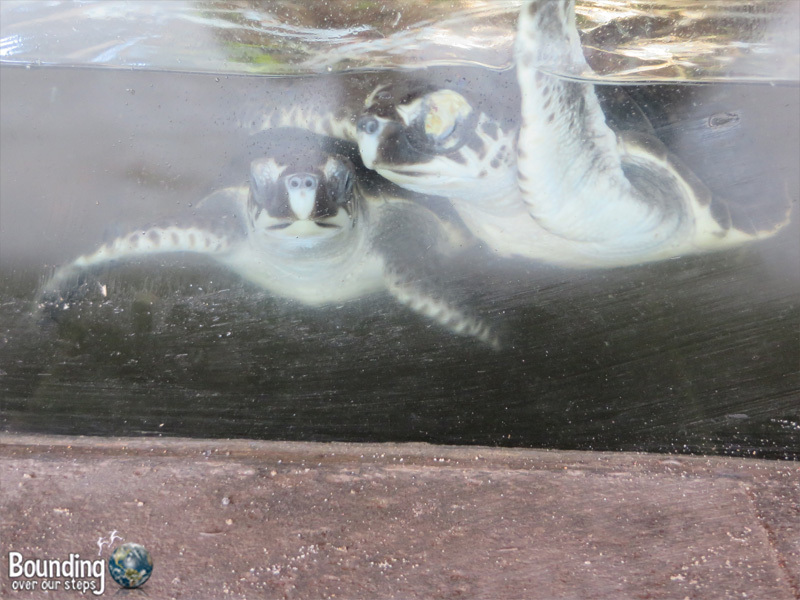 Given the statistics of the shrinking sea turtle population we weren’t sure we would be able to see any, but we knew that we would enjoy looking at other amazing sea animals in this part of the world. Ready for snorkeling with sea turtles! About 20 meters off the shore, past a regenerating coral reef, is a deep sea wall. Although likely not too tall, floating at the water’s surface, looking through our snorkel masks into the darkening blue, it seemed like we were staring into the world’s deepest abyss. Any looming fear we may have had quickly vanished, however, when we suddenly spotted a large sea turtle gliding effortlessly against the strong, southbound current. What a beautiful moment as we glided along with her through the water. This is what we had come for! We felt like we were enjoying the world’s best amusement park ride as we started up north, rode the current southward, got out at the turtle sanctuary and said hi to the baby turtles, walked up the beach and did it all over again. Each time we saw at least one turtle and our best run was when we spotted four of them! But little did we know that our most amazing experience was yet to come! On our second morning we awoke before the sun and dragged ourselves to the beach with snorkel gear in hand. The water was cooler than the day before and chilled us as soon as we entered. The sun had risen but was still hiding behind a mountain. We walked out a little ways, lifted our feet and simply let ourselves be pulled down the eastern side of the island. The current seemed much stronger than the day before. We saw lots of sea life waking up and some very strange brightly-colored creatures, like something that looked like a centipede scurrying along the rocks. But there in the distance was the familiar grace of a sea turtle swimming towards us. Although very tired we tried with all our might to swim upstream to spend more time watching the turtle, who was coming up to the surface for a breath of morning air. We followed and poked our heads out of the water in sync with the turtle and that’s when we noticed that behind the tiny turtle head was the sun poking out from behind the mountain. It was an incredibly magical moment and it seemed the turtle lingered a moment as well. Watching the sunrise with a sea turtle is an experience we will not soon forget! Snorkeling Tip: the best chance to spot a wild sea turtle in Gil Trawangan is near the edge of the sea wall between the Almarik and Horizontal Hotels. 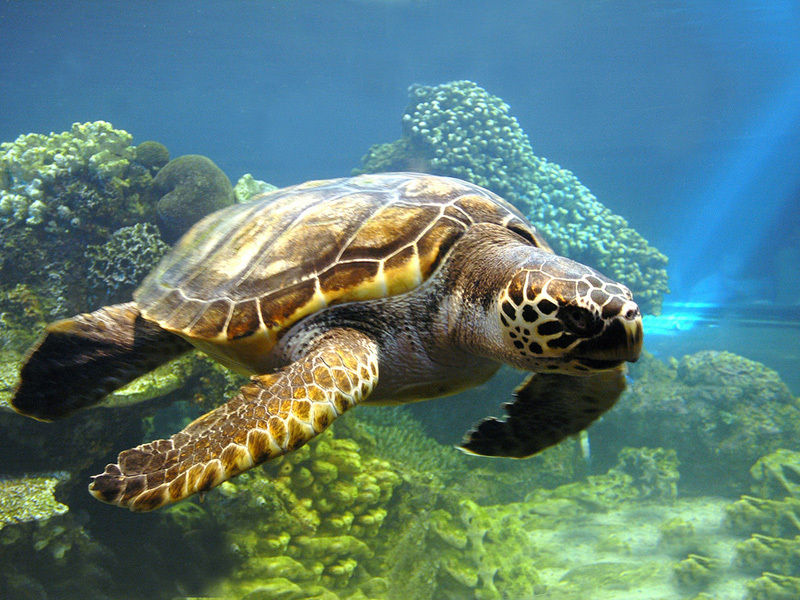 Where have you swum with sea turtles?